On Monday the 16th of December, Egypt Information and Communications Technology Trust Fund (ICT-TF) participated in the first of its kind conference entitled “the International Information Technology conference in rural societies”. 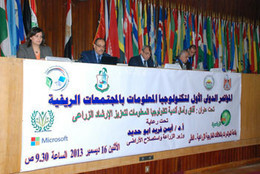 This conference took place in the conference hall at the Egyptian Ministry of Agriculture premises, in Doukki, Giza. His Excellency, the Egyptian Minister of Agriculture, Dr. Ayman Farid Abou Hadid, opened the conference with a speech highlighting the vital and pivotal role of information and communications technologies (ICTs) to meet today’s challenges. That was why His Excellency stressed the importance of collaborating with the Egyptian Ministry of Communications and Information Technologies (MCIT) to improve agriculture processes and institutions especially that of extension officers. Dr, Alaa El Hayess, the director of the geographical information system unit who is currently in charge of the protocols between the Egyptian Ministry of Agriculture and Land Reclamation and the Egyptian Ministry of Communications and Information Technologies (MCIT) illustrated the importance of these protocols which include several projects. One of its most important projects is that that adapts ICTs to improve services given to civilians and to allow much wider community participation. This results in accelerating the information community development. During the conference, Egypt ICT-TF held a session to discuss the role of international organizations in promoting the use of ICTs for development. The session was given by Dr. Ibrahim, Director of development and research unit at ICT-TF, where he presented the fund technical services and tools that serve the agriculture filed and the fund effort to build a knowledge community development and network through Kenanaonline portals, www.kenanaonline.com. A number of success stories for governmental, civilian and experts, resulted from Kenanaonline portals were presented. The most important success story was on the General Fishery Authority portal on kenanaonline, www.gafrd.org, as around 7 million has visited the portal in addition to its continuous support for 30 special websites on its portal. Plus, Dr. Maryam Hazaman pinned down Egypt ICT-TF agriculture expert system service, www.khobara.org, that was developed in collaboration with the Central Laboratory for Expert Systems using a multimedia video. The video showed the service value added to extension officers and farmers while stressing on the effectiveness of the service internet and mobile applications in rural communities. In the second part of the conference, Dr. Mohamed Abd El A’aleem El Ramly, the director of the Research Institute for Extension officers, and Eng. Hani Mousa, Director of Project Administration at Link Davobment Firm gave a session under the name of “ Successful Community Partnership at the institutional and community levels”. At the end of the conference, several recommendations were approved which underlined the importance of using ICTs to accelerate the development process in the Egyptian rural community.